This issue was a doozy! 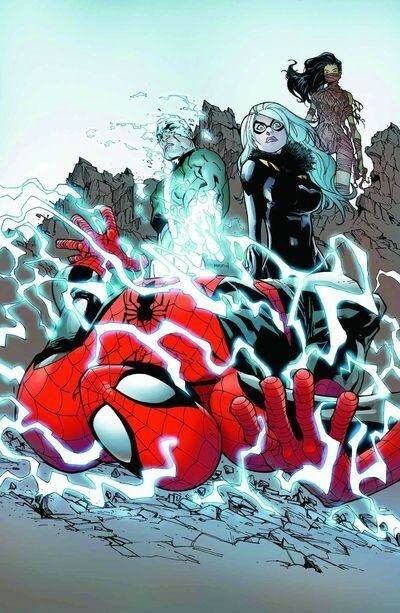 In a very frenzied, familiar way, Amazing Spider-Man #5 follows Peter as the recent events in his life are all building to a bunch of bad luck, due in a rather large part to his once friend, now enemy, The Black Cat. Also, spiraling out of the events of the current Marvel event, Original Sin, this book has a little bit of everything thrown into the mix. Because of Original Sin, many heroes in the Marvel Universe have come face to face with skeletons and secrets that have been buried deep in their closets. 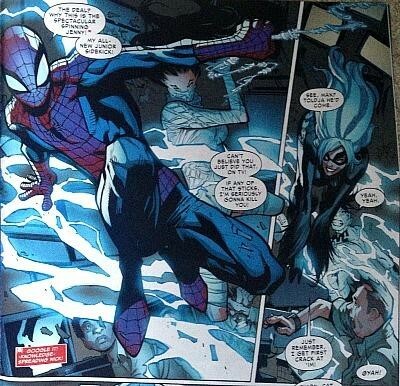 Spidey is no different, and he has recently discovered that there is another person out there with the same powers as his, and bitten by the same radioactive spider from waaaaaay back in his origin. 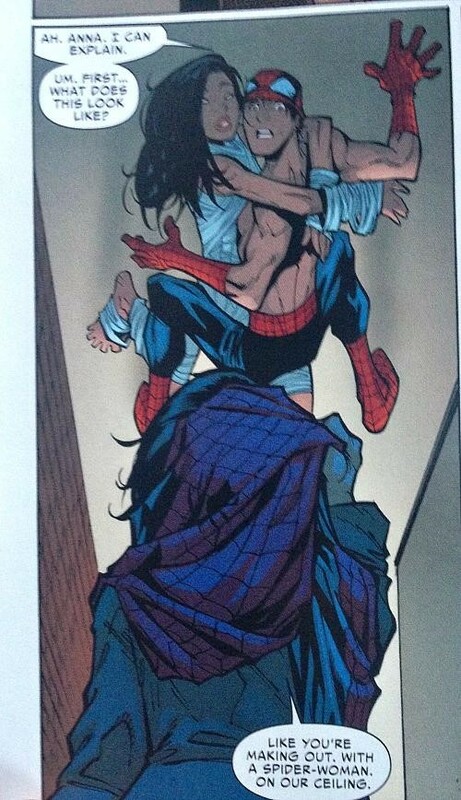 Cindy Moon, or as Peter dubs her ‘Spinning Jenny’, seems to be a legit spider-person, with powers that match and almost eclipse Peter’s own. Her spidey sense tingles before his, her reflexes are a little sharper, you get the picture. Also, Cindy and Peter can’t seem to shake some serious primal urges when they are close, which they have been since Peter broke her out of her holding cell last issue. This issue has a lot of old school flavor to it. Favorite villians like Electro and Black Cat have big parts, as well as The Negative Man and The Eel. J. Jonah Jameson is charging head first into reporting again, after losing his mayorship, and is about to make his first steps into TV Journalism. Even good ol’ Aunt May makes an appearance in this issue, and it almost feels like Flash or Mary Jane is just around the next panel, but they don’t show. Peter tries desperately to juggle all the craziness that is happening to him since he finally got his own mind back, and got rid of Doctor Octopus mucking up his life. The frantic rush from trying to deal with this new spidey-girl, to dealing with his ex girlfriend/Doc Ock girlfriend Anna Marconi, and also having to represent his company Parker Industries on TV is maddening for the hero. All of that feels right at home in the Spidey-verse though, and a welcome throwback to the normal days of Peter trying to just get through the day, when it seems like everything is against him. Everything is against him, and in a very big way, thanks to The Black Cat, who has a big score to settle with Spider-Man. 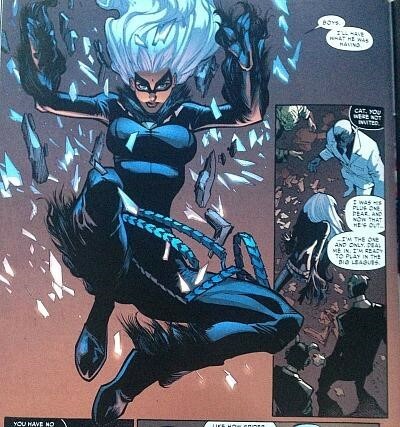 When Peter was being controlled internally by Doc Ock, he outed The Black Cat’s identity, and also her credibility as a thief. Now she wants revenge and has employed the not-so-sane Electro to help her to that end. She is out for blood, and with her ‘bad luck powers’ seems to be very close to achieving it if the last panel reveal will pan out in the next issue. I won’t ruin it, but it is classic spidey and a big development if The Black Cat is successful. Dan Slott knock this issue out of the park, and he has been doing that consistently now for a long time. Even splitting his time between the events of this issue and his new event ‘Edge of the Spider-Verse” that started in the new Superior Spider-Man (check out my review of that issue), he doesn’t falter here. This issue feels familiar, like a warm blanket made of spiders. No, that sounds terrifying, but you get my point. With the villains banging down spidey’s door, and Peter trying desperately to deal with all the craziness in his life right now, this is a story that could be found in classic Spider-Man tales. The artistic team of Humberto Ramos, Victor Olazaba and Edgar Delgado continue also to churn out quality, eye grabbing imagery to amazing storytelling. I am still not sold on this new spider-girl-person, Cindy Moon. I know it’s a shake up, and it is meant to tie into the larger picture of Original Sin, but I feel it might be a forced plot point. Peter has some fun with her, in more ways than one this issue, but I am afraid this might be a character that will fall flat as the story pans out. But only time will tell, and I have to try and quell my worry and trust in the work of Dan Slott. CBH Score: 4 out of 5. Excellent storytelling throughout, and a ton of action. Very interested to see the first few panels of issue six.